Distimo which is an app store tracker for statistics, based in the Netherlands, reported in December 2011 that the Android Market has already mounted up to 400,000 applications. 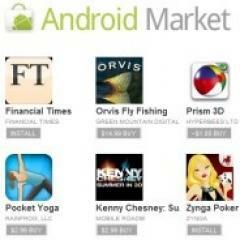 This is an accomplishment for the Android Market because it has showed a faster growth than its rival which is Apple. The Android Market grasped 200,000 available apps just in April 2011, and 100,000 got added by the month of August in the same year. This actually means that the Android Market only requires four months to add 100,000 new apps. At this increasing rate, it would probably reach 500,000 apps by May 2012. If this target will be achieved by Android then it will beat its competitor in the month of May 2012. Not only this, the number of apps developers is also increasing at the simultaneous rate. The next best move which Android can make in becoming successful is to look up for the match of apps that would be relevant to the nature of business and take a wide look towards the interest of people and customers especially for the features that would both attracts them and which have disappointed them. After taking into account all these factors then an app should be designed according to the need of current market.